Our range of products include chirag brick production line, chirag block production line, chirag brand new cement block making machine, chirag powerful technology hydraulic block making machine, chirag hi resistance hollow block machine and chirag eco friendly concrete block machine. The raw materials area: 2500m2. 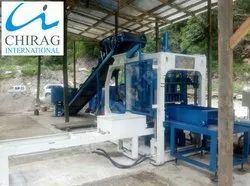 Chirag Block Production Line We are offering block production line to our customers. Chirag Block Production Line This model has been applied for the patent protected by state laws, counterfeiting is not allowed (Patent No.201220242625.7). Chirag Brand New Cement Block Making Machine offered by us can be used for making all types of construction material such as Chirag Brand New Cement Block Making Machine fly ash brick, concrete block, interlocking brick, interlocking block, interlocking paver etc. We are engaged in offering a wide range of Chirag Hi Resistance Hollow Block Machine ( This machine is Multifunctional, Could make all kinds of Blocks,Bricks and Pavers while change the moulds.) Simple structure; small occupying area; stable and reliable function and convenient maintaining; Simple manual operation enables the workers to learn fast; This machine combines many functions into one with low consumption. It is adopting with multi-valves in series, electricity discharging unit and compressing and vibrating organic combing unit to materialize the highest molding and density of the finished products.Chirag Hi Resistance Hollow Block Machine Auto pallets conveying, pallets feeding and compulsive materials arranging have highly raised up the production efficiency and reduced the working intensity, while simple pallet conveying and feeding units can be installed for production. Chirag Eco Friendly Concrete Block Machine Unique design. 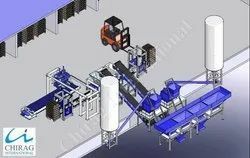 The special loading and supply unit, the multi-line whipping forks are fixed at inside of material feed box. The whipping forks works and feed the material to mold box forcedly during the material feed box moves to up of mold box, the feed will smoothly and equalization, than for the product, the intensity is insured and the weight is equal. Chirag Eco Friendly Concrete Block Machine Multi use; strong performance; the many kind of products with difference form and size can be made when use the difference mold , such as wall block, honeycomb type block, road block and slope block. Chirag Multi Speed Ash Brick Machine The whole process uses a PLC aptitude control and dialogue system of human-machine interface, easy to analyze the chance signal, fault diagnosis and parameters setting, ensure the best operation effect of the machine. 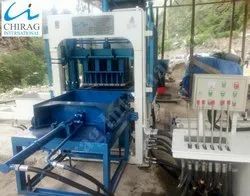 Chirag Multi Speed Ash Brick Machine Multi use; strong performance; the many kind of products with difference form and size can be made when use the difference mold , such as wall block, honeycomb type block, road block and slope block. We are leading manufacturer and exporter of Chirag New Technology Fly Ash Brick Machine, Fully Automatic Multifunction Brick Machine, Multifunction Block Making Machine, Block Machine, Block Making Machine, Concrete Block Machine, Hollow Block Machine, Concrete Block Making Machine, Cement Block Machine. This machine is Multifunctional, Could make All kinds of Blocks, Bricks and Pavers while change the Moulds. Chirag New Technology Fly Ash Brick Machine All in One Machine: Fly Ash Brick, Concrete Block, Interlocking Brick, Interlocking Block, Interlocking Paver etc. 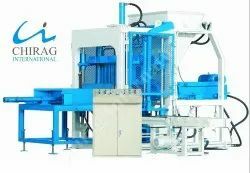 Chirag Integrated Advanced Hydraulic Brick Machine Compact design and Auto & semi-automatic control, with easy operation. Low investment brings you cost saving. Chirag Integrated Advanced Hydraulic Brick Machine The moulds are changeable, and it is able to produce various kind of blocks,bricks,interlocks, pavers and kerbstones in different types, sizes, shapes, and colour layers. 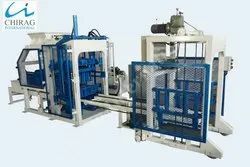 Looking for “Brick And Block Production Line”?